Hi everyone. 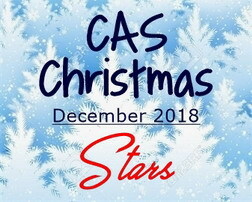 Today is the launch of the last challenge of the year for CAS Christmas. This month's challenge is being hosted by the talented Trina (Phamtastic Design). I hope you'll check out the challenge blog to see the beautiful star cards from our Designers and wonderful Guest Designer, Cindy (Escape to Stamping). Then come play along. The challenge is only open until the 15th this month to provide time off for our Designers during the holidays. Hope to see you in the gallery! I think this is so neat. Love it! I got to try this technique! Such a contemporary and artsy card. Fun idea with the colours and CAS perfection x.
I LOVE your very CAS design, Loll! The shape of your star has such a great organic feel, and I love that you chose a rainbow of colors to show it off! You have definitely inspired me to play along...thanks! Fabulous CAS design, love how the rainbow star is colored! What a pretty rainbow star, Loll! Love those bright colors and the sketchy look of the star! Festive and fun! Love your beautiful rainbow star - it has a real folk art look to it that really appeals to me! Oh, wow! The rainbow star is very creative! Just perfect, love it!! Outstanding CAS design, Loll! Love this idea and love your rainbow colors. This one would be fun to reproduce too. You make my CAS heart go weak at the knees.. with your gorgeous CAS creations Loll. Heart weak at knees?? I don't think that's a proper English, but I am sure you know what I mean. This is fabulous And the cool technique..ooh..wants me to try it soon. Loll this is stunning - so colourful and yet so CAS and absolutely stunning! Wow, your CAS sure packs a big punch! This is gorgeous! So clever and cute. If you hung this in a gallery it would be snapped right up. It is so colorful and happy. what a fantastic rainbow star Loll!! Fantastic artsy star Loll. Love the rainbow colors. Merry Christmas to you and your family. Stars and rainbow colors???? You know how to make my heart go pitter-patter! Fabulous card! This is such a simple, fun, and artsy star card, Loll! 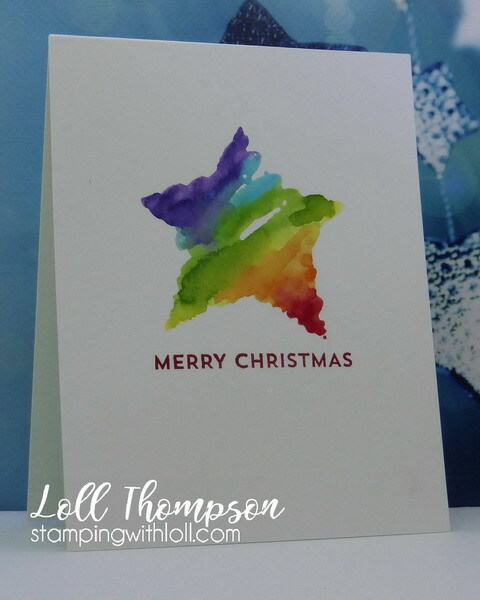 Fantastic idea to use rainbow colors for the scribble star stamp! I would have never thought of it. Wonderful job of dividing the rainbow colors cleanly and leaving an organic feel. WOW! I think everything has already been written! My WOW! is a tribute to your artistic genius. I love how this star has the colors imposed. It's amazing! I just love what you did with this star, it just looks so artsy but so festive and fun. It has been great to see you enter each month at the Rudolph Days Challenge. Good Luck! 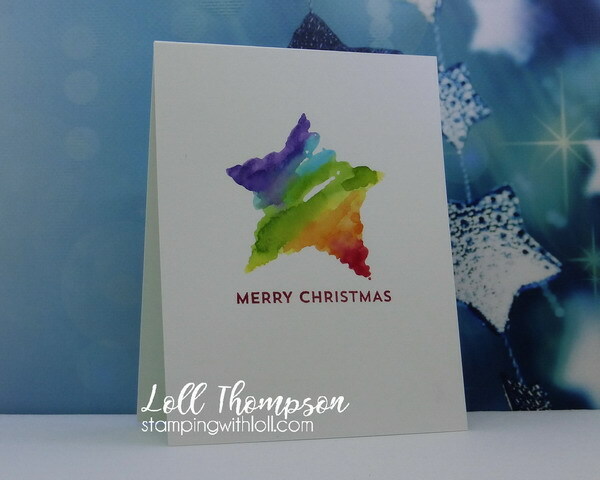 Just love the rainbow colors in your star, Loll - so fabulous with the blending of colors! !